"The deeper we immersive ourselves into the desert, the more everything seems like a dream." IFC Films has released yet another official US trailer for the Werner Herzog feature film Queen of the Desert. This premiered at the Berlin Film Festival way back in 2015 and was originally slated for release that year. Unfortunately it's a totally awful film, with no redeeming qualities (despite a rather intriguing cast) and was shelved for two years. It looks like this is finally going to see the light of day, and it's going to be forgotten quickly, but here's the new trailer anyway. Nicole Kidman stars as the legendary Gertrude Bell, who was an important British figure in Middle East relations in the early 1900s. The cast includes James Franco as Henry Cadogan, Robert Pattinson as T.E. Lawrence and Damian Lewis as Charles Doughty-Wylie. I mean it when I say this film is terrible - don't let that cast fool you, this isn't worth your time. Move along. You can also still watch the original US trailer for Queen of the Desert here, first released two years ago. The film tells the story of Gertrude Bell (1868-1926) who, as historian, novelist and member of the British secret service, played a decisive role around 1920 in setting the course for the new political order in the Middle East. A chronicle of her life, a traveler, writer, archaeologist, explorer, cartographer, and political attaché for the British Empire at the dawn of the twentieth century. 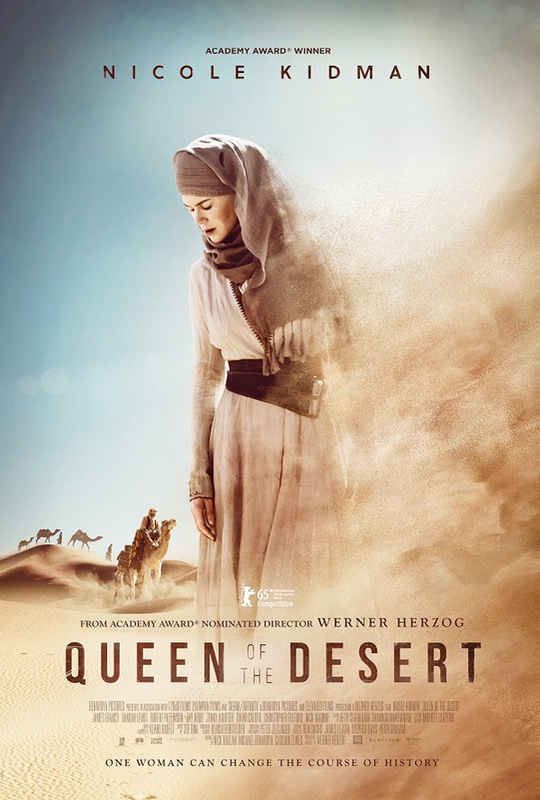 Queen of the Desert is both written & directed by acclaimed German filmmaker Werner Herzog, of the feature films Aguirre the Wrath of God, Nosferatu the Vampyre, Fitzcarraldo, Invincible, The Wild Blue Yonder, Rescue Dawn, Bad Lieutenant: Port of Call New Orleans, My Son My Son What Have Ye Done?, and Salt and Fire previously. This first premiered at the Berlin Film Festival back in 2015, and has been waiting ever since. IFC Films finally opens Queen of the Desert in select US theaters + on VOD starting April 14th, 2017. Is anyone still interested?